HAZLET, NJ — U.S. Representative Frank Pallone (NJ-06) truly serves his constituents. The 15-term congressman got behind the fresh order deli counter of the QuickChek fresh convenience market at 1170 Route 36 in Hazlet, NJ on Friday, February 2, 2018 as part of a National Association of Convenience Stores (NACS) In Store event, an award-winning program that enables elected officials to experience first-hand the community experience at their local convenience store. 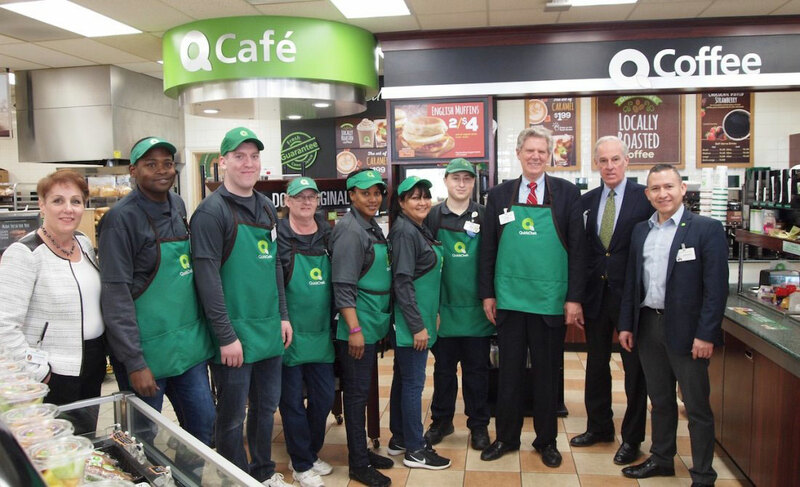 Congressman Pallone assembled a custom made-to-order QuickChek sub and a side order of mac and cheese and personally delivered it to a customer during his one-hour visit Friday morning in which he also learned how the company brews its award-winning locally roasted coffee and received training on the store’s registers while interfacing with store team members. The event is one in a series of nationwide industry events celebrating the success of convenience stores and their economic, cultural and social contributions to the community. QuickChek certainly fits the bill: the family-owned company based in Whitehouse Station, NJ is a market leader in food services with an exceptional fresh coffee and fresh food program offering restaurant-quality food at value prices. QuickChek was named the 2016 National Convenience Store Chain of the Year and its renowned globally sourced, locally roasted fresh coffee was named best in America in a national consumer survey by Technomic in 2014. Each QuickChek store employs 40-45 locally hired team members, including eight managers, and generates approximately $1 million in tax revenue, adding to its positive impact on the local community. Congressman Pallone, who represents New Jersey’s Sixth Congressional District covering most of Middlesex County, the Bayshore and oceanfront areas of Monmouth County, toured the store and discussed issues important to the business with QuickChek CEO Dean Durling while also engaging store customers. “We are delighted to have Congressman Pallone visit our store and gain a true sense of our business, our total dedication to serving the needs of our customers, and the role we play in our communities,” said Durling, whose company has 154 locations throughout New Jersey, New York’s Hudson Valley and Long Island. QuickChek enjoys the rare distinction of being named one of the best companies to work for in both states. It has also been named one of the most generous companies in New Jersey having raised millions of dollars for causes benefiting children, families and military veterans including $1.34 million over the past four years. The U.S. convenience store industry is comprised of more than 154,000 stores nationwide selling fuel, food and merchandise and serves 160 million customers daily — half of the U.S. population. Industry sales make up 10.8% of total U.S. retail and foodservice sales annually.